:Bible study is an important spiritual discipline, but it can be intimidating and often difficult for newcomers. The four-session coloring Bible studies for adults in this series are designed for group use and as outreach to new Christians and non-Christians. Incorporating coloring, the text of The Message, and a mix of study and reflection questions, the new Drawn In Bible Study series offers a unique on-ramp experience for those new to Bible study, and a refreshing holistic approach for seasoned Bible students. 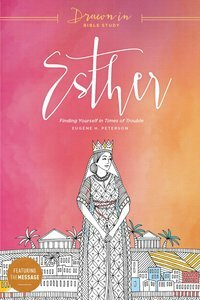 In Esther: Finding Yourself in Times of Trouble, readers will get to know Esther, the unlikely queen of Persia who found her voice in a time of crisis. This study features pages for coloring, the earthy language of The Message, and questions that help you understand not just the text of the Bible, but your own connections to Esther's story. About "Esther (Drawn In Bible Study Series)"